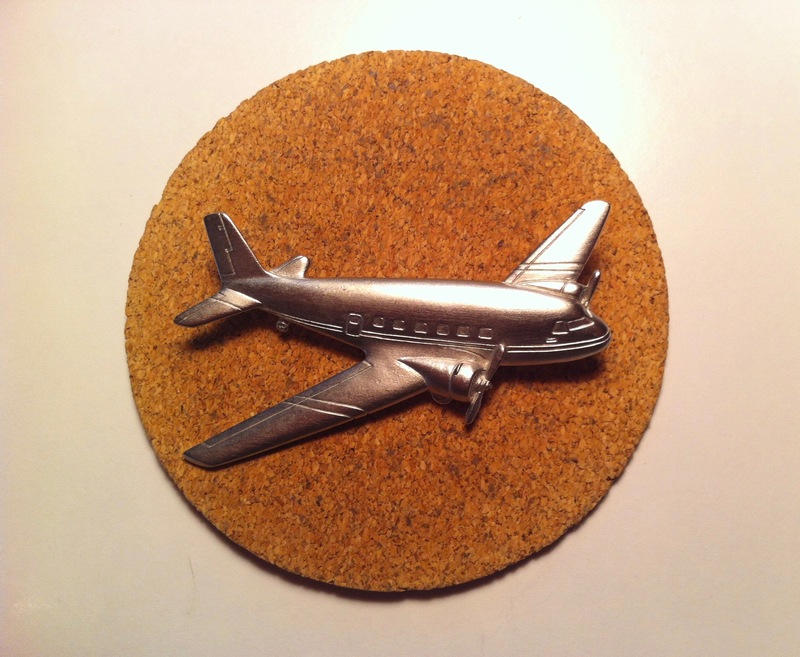 THIS DOUGLAS DC-3 pin was the object of my recent rummaging through the desk. 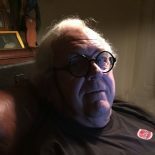 The search was prompted by a cameo appearance of Donald Douglas in a recent item here at SimanaitisSays. This in turn reminded me of having flown years ago in DC-3s. 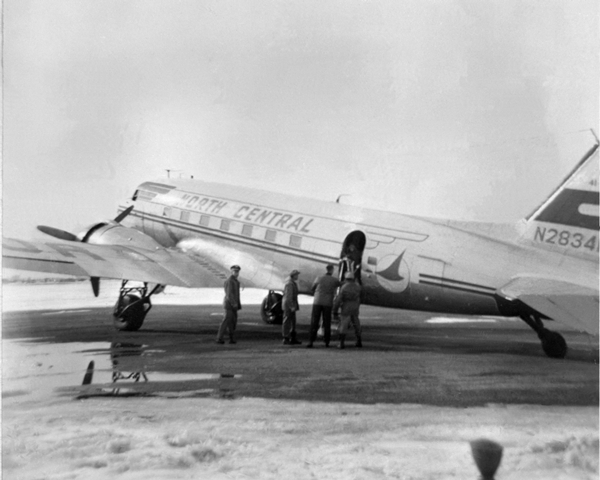 The Douglas DC-3, as in Douglas Commercial series 3, owed its genesis to the DC-1, DC-2, and American Airlines’ night-sleeper service using outmoded and aging Fokker tri-motors and Curtiss Condors. The DST, Douglas Sleeper Transport, was wider than the DC-2, carried 14 sleeper berths, and first flew on December 17, 1935 (the 32nd anniversary of the Wright Brothers’ first flight). The DC-3 replaced the DST’s berths with seating for 21 passengers and became the workhorse twin-engine air transport for three decades. American Airlines DC-3. Image from Airliners Between the Wars 1919-1939, by Kenneth Munson, illustrated by John W. Wood, Blanford Press, 1972. Only 607 DC-3s were sold between 1936 and the onset of World War II. On the other hand, these aircraft were sold to firms in 11 different countries; in the U.S., American Airlines and 12 other airlines bought them. 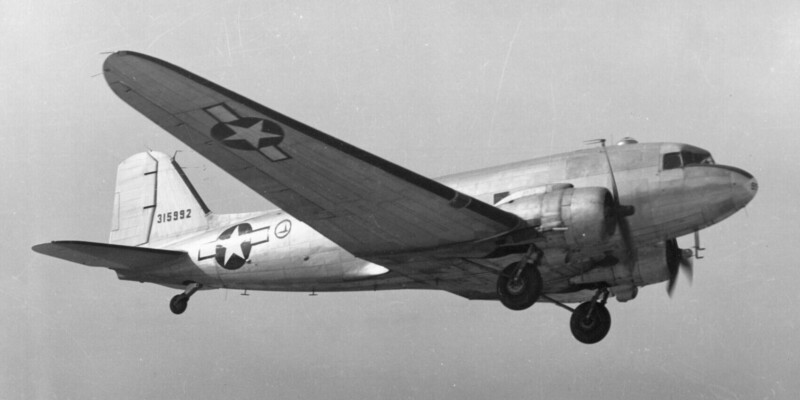 During wartime, Douglas built 10,048 C-47/C-53/Brit Dakota military versions. Another 4937 were added under license in the Soviet Union between 1939 and 1950. And 487 Japanese Mitsubishis (codename Tabby) were built between 1939 and 1945. After WWII, surplus C-47s flooded the market, with an eventual total of 97 countries registering them. Of the 16,079 aircraft produced, it’s estimated that a few hundred are still airworthy; this, according to a 2014 article at cnn.com (which contains an interesting video). 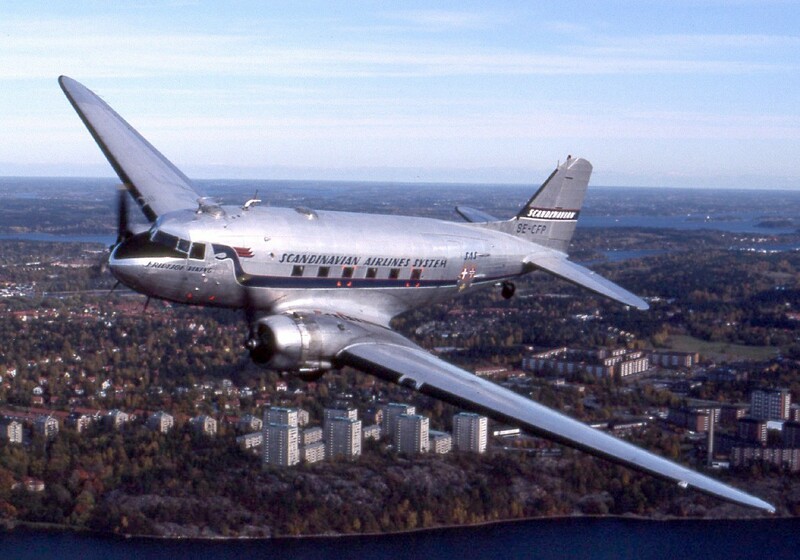 This DC-3, in period Scandinavian Airlines System livery, flown by Flygande Veteraner as recently as 1989. Image by Towpilot. From June 1948 to May 16, 1949, the Soviets tried to isolate the 2 1/2 million people of West Berlin divided from the rest of West Germany. The C-47, its Brit Dakota and other aircraft made history in the Berlin Airlift. Everything from coal to flour to Spam arrived in a high point of humanitarian relief. 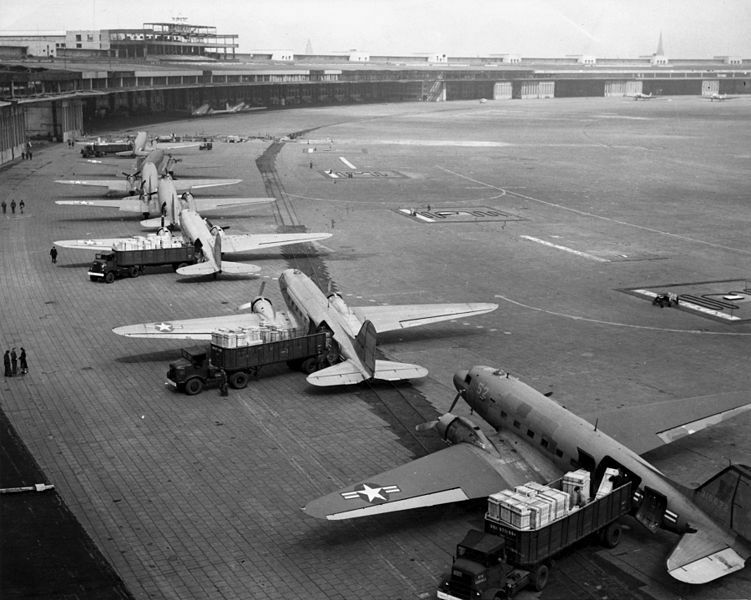 C-47s being unloaded at Berlin’s Tempelhof airport. Image from Bridge Across the Sky: The Berlin Blockade and Airlift, 1948-1949, by Richard Collier, McGraw-Hill, 1978. For a good many years after WWII, DC-3s in commercial service around the world outnumbered the total of all other types of transport aircraft put together. As late as 1970, nearly 900 were still in use. An Aerolineas Argentinas DC-3. 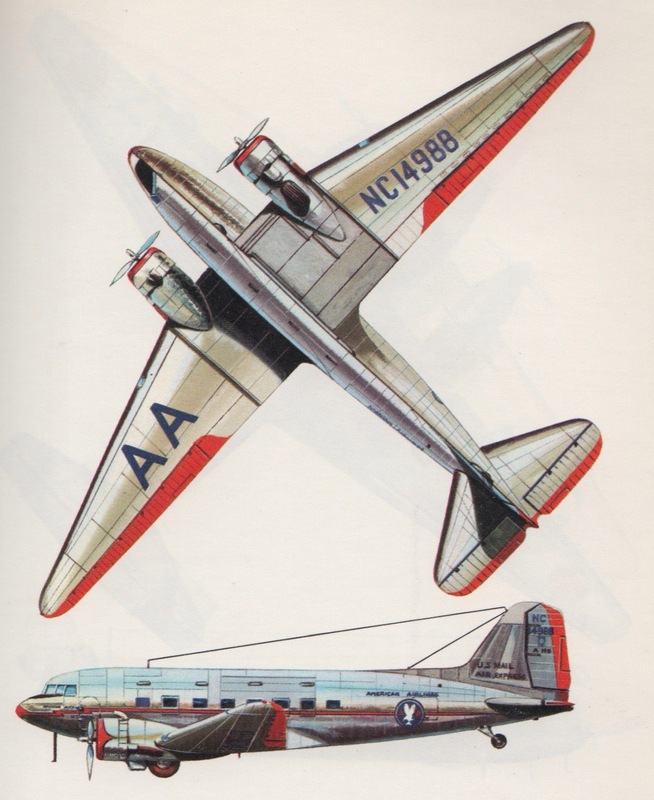 Image from World aircraft, 1918-1935 (Rand McNally color illustrated guides), by Enzo Angelucci, illustrated by Paolo Matricardi, Rand McNally, 1976. That was about the time I had my first of several flights in DC-3s, when I lived on St. Thomas in the Caribbean. I’ve forgotten details, but from contemporary photos it must have been Air Caribbean DC-3s flying routes including STT and San Juan, Puerto Rico. The DC-3 is a tail-dragger. And anyone who has ever flown in one remembers the steep climb from door to seat. I recall sort of pulling myself up the aisle by gripping seat backs in turn. A North Central DC-3. Image from deltamuseum.org. My first long flight as a youngster was about1945>46 from New York to Portland Oregon in a DC3. A rough weather flight (actually a series of flights) that had everyone , even the Stewardess, vomiting on occasion. On the ground I don’t think it was possible to make your way from the back to the front without using the setbacks to pull yourself along. It was even a bit like that in flight. My (sadly late) cousin, Norm Stevens, flew the Berlin Airlift. He said it was the worst parts of flying into San Diego and Aspen plus not infrequent Russian potshots. Like others involved, a very brave person. I think of the Boeing 737 as the spiritual successor to the DC3, a workhorse plane that just keeps going and going. Just a little (lot) less shaking going on. Your pin reminds me of the small plastic model replicas of aircraft back in the 60’s that they used to hand out to kids, back in the day when a visit to the cockpit was still not only possible, but actually encouraged, for the little jet setters. I’m sure you are familiar with the example (the entire aircraft) that hangs from the ceiling of the Henry Ford Museum in Dearborn. The literature states that when it was hung there, the airframe had accumulated more flying hours (over 83.000) than any other in history, going through 550 main gear tires and wearing out 136 engines. It had taxied over 100,000 miles. Its flying hours record was broken by – you guessed it – another DC-3. This entry was posted on August 23, 2017 by simanaitissays in Vintage Aero and tagged Douglas DC-3 C-47 C-53 Sky Train.